Pour into serving cups and let stand to cool or refrigerate, undisturbed, until it’s set – about an hour. Notes: For some reason, when I stir the pudding while it’s cooling, it refuses to thicken and set. So don’t stir it until it sets. 100 Comments on "Custard Pudding"
I have made this twice today and neither batch turn out.I poured both of them out after cooling for hours (yes I did say POURED, like liquid). I cannot get this to set and cannot figure out why. Am I not cooking it long enough? Is there an order to put in the ingredients? What can I do???? Assuming you let it cool undisturbed, I don’t really know. Can you please list all your ingredients and I’ll see if I can help. Just made this custard/pudding and it is delicious!!! I cooked in a double boiler over water, turned out perfect. I was looking for this recipe. My Mom always made custard this way. Even id she was making coconut cream pie. It was delicious. Thank you. I add 1/2 teaspoon vanilla to mixture, and sprinkle a little nutmeg on top after pouring into cups. YUMMY!!! i CAN’T NOT BELIEVE HOW DIFFERENT CUSTARDS RECIPES THERE ARE. SO DIFFERENT FROM EA OTHER. HOW DO YOU KNOW WHICH ONE IS THE BEST?? Can u use heavy cream instead of milk for a thicker creamer texture? Hi, I just made this great custard w 1/2 1/2 and milk and a c of w cream.I layering it in a trifle. Have not decided if I will mousse it with tempered egg whites. I made 4 batches at 1 time. I would not make it all w Cream.May be temperamental and clot. Not smooth as u would like. Great recipe…. I Maki it at least once a week…. Thank you!!! I don’t know if anyone addressed your comment about the custard not setting if you stir it while cooling but that is a characteristic of cornstarch puddungs & sauces. Stirring will “break” the structure. Thanks so much for explaining this – I learned something new! I would like to try your custard but as both my wife and I are diabetics we avoid sugar. Can I make this using Splenda? Also, do you have a recipe for sugar free chocolate pudding.? I’m sorry, I have no experience with sugar-free desserts. Try a organic granulated stevia. Avail on Amazon. Try for sweetness. Cut back if needed. Excuse me, cornstarch has 7 gms of carb per tbsp. Far less than a piece of toast. Especially split even for 2 people. You should try looking at the Splenda website. They have wonderful sugar-free recipes. Enjoy! Nope sorry, look it up. 1 cup is 87 on the glycolic load, more specific than index. 1 CUP. Yes u can make it with Splenda. It is just as good. My Grandmother always put Mace cinnamon vanilla and nutmeg in her custard , rice and bread puddings == Delicious. I loved this recipe for custard pudding!! I feel like the addition of cornstarch alleviated much of trouble that I traditionally run into with custards (sometimes it doesn’t thicken as well as I’d like). THANKS! Oh, I also added a little vanilla, sooo yummy! I put some cooked rice in to make it rice pudding. It is delicious! I added a 1/2 cup of peanutbutter to this custard and use this for my peanutbutter pie filling! So creamy and my family loves this recipe! I made this and love it! I make it for my sick friend and she loves it. Thank you, hope to see more of your good receipes. Was so easy and good,had to be on soft diet was looking for something dif and this was great. Still eating it even tho not on soft diet anymore! How much vanilla extract may I add? Do u have to put it into single servings or can i put it into one bowl? Either cups or a bowl will work. It makes 4 one-half cup servings. subbed 1% milk for 2% (It gave it a thicker and creamier texture)and added some vanilla extract. Quick and tasty comfort dessert…I rarely wait an hour to enjoy. I like it creamy and warm as opposed to thick. Yum! Thanks! Can you use whole milk or lactose free whole milk? Also can you add vanilla flavoring? Thank you!! None of my recipes include cooling time so 15 minutes is the correct time to make this recipe. I hope you liked it once you had some. Comes out perfectly every time! Very easy to make! I’ve doubled the recipe and that comes up good. I have only made this recipe the way I posted it so I’m not sure what you’ll get if you make too many changes. I guess you will just have to try. Your best bet at first would be just to double all the ingredients and see how it turns out. Puddings and custards can be a bit temperamental so good luck. I believe you are looking for what is known in my part of the country as Pioneer Pudding or Bread Pudding. It is a fabulas desert and has the custard component. Raisins and cinnamon are often added as well. It’s great served warm and vanilla ice cream on top! Try looking under those titles for variations with the bread pudding type desert and if anyone has any good recipes for that, please share it with me, as my Mom and sister passed away and the recipes were lost with them! Thankyou all! I wish I knew but I only cook for two. You may have to test it out. Jenny, my mother made custard pies something like this. Boiled the custard on the stove, put it in baked pie shells then used the egg whites to make meringue Then browned them in the oven. She had no recipe and for years I have tried to figure this recipe out but have not had any luck. I remember she did not add vanilla , just scrapping off a nutlike thing which I can’t remember what it was called. I’m 75 now an still in search of this recipe. Can you help me figure it out? Thanks friend. You might be able to make something like that using my custard recipe and the nut-like thing was likely nutmeg. Sounds like classic American custard pie. I think you use cream of starter in the egg whites and sugar. Makes them stiffer. I have only made it with milk so I don’t know. It’s best to look for a recipe that uses the ingredients you have rather than make changes. I have made custard pudding using coconut milk and it comes out very tasty. You may have to change the amount of sugar added if your coconut milk is sweetened. 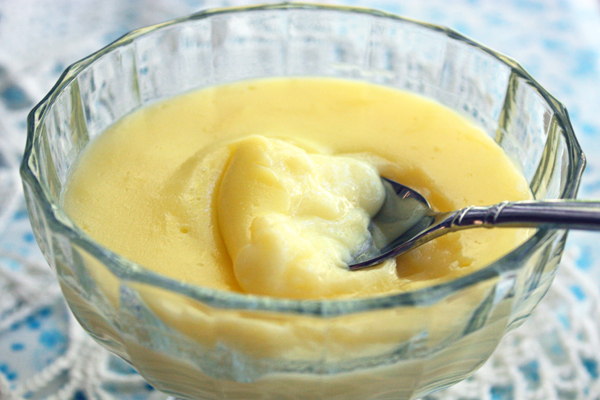 This custard pudding can also be made with almond milk. Yes, after you take it off the stove. Just made a batch,used full fat milk looks good tastes great 😉😁thank you.. Thank you for this simple and delicious recipe. I was recently in East Africa, where corn powder is called “custard powder”. But, I did not know that “custard” there is something you can pour; if it sets, it is then called custard pudding. So I was quite confused when I made “custard” with just the custard powder, sugar, and milk, and it did not “set”. But, you set me straight. Thanks. I have never used whole milk so you will have to try. Managed to find cornstarch from supermarket. May i asked what kind of milk do you use? What’s 1% milk? Thank you. Appreciated and thank you for detailed info. It’s wonderful to see you back .. generously sharing your recipes with us again. I’ve tried making custard pudding. It’s so smooth and creamy. My family has never tasted such a good pudding and we really enjoyed it very much. We’ll be making again. Thank you for your patience and guidance. Could I put plastic wrap over it to prevent a skin while its cooling? You can put plastic on it while it’s cooling but there is almost no skin on this pudding, maybe because I use 1% milk. It’s hardly necessary at all but there is no harm in using the plastic if you choose. Instead of pouring the pudding into the serving cups to cool, can I did what you did in the video for the doughnuts and pour it onto a plate or two so that it can cool faster? You can do that but then you will have to scrape it off the plate into a serving dish and it might not look so pretty. I know what I did wrong! I made this with egg whites. I use egg lands best also I just read the recipe wrong. My fault now the pudding looks just like yours. Pudding can be made with flour but I think you need more flour than cornstarch and it has to cook longer. I don’t believe it would be as light as one with cornstarch but if you don’t have cornstarch, it’s best to find a different recipe that uses flour for the exact ingredients. use a 3:1 ratio to replace flour for cornstarch and cook 2-3 minutes longer tast a little to see if it has a raw flour tast, if it does cook a little longer. I made this today and we ate it this evening for desert. Very yummy! But why does your photo look yellow like vanilla pudding? Mine turned out totally white. I followed your recipe to a t. What did I do wrong? I know from using different eggs that some yolks are deeper in color than others. I use Eggland’s Best and their yolks are more yellow than the others I’ve used. So it’s probably that your egg yolks are just a lighter color. it’s a good idea to cover the pudding with plastic wrap as it cools so that it touches the surface of the pudding. That way you will never have that skin forming on top. That’s what I always do anyway:) Thanks for the recipe. I love to watch and hear you talking while making your recipes! You make it look so easy (I don’t like cooking, but I like to watch others doing so). I will make this custard this week because it looks so easy and tasty too. Love all your serving dishes and tools as well – keep it up! I love your recipes and I really enjoy your video presentations….you make cooking fun! Can I substitute coconut milk or almond milk in your custard recipe. I m allergic to dairy. I haven’t made my custard with either one but I looked online and see pudding recipes using cornstarch with either coconut milk or almond milk so I believe they would work in my recipe. Hey Jenny- Have you ever put plastic wrap directly on the top of the custard while it cools? I do this with my pudding, making sure there is no air bubbles. I never get that ‘thick’ piece or ‘skin’ on top; creamy all the way through. Hey Jenny…Love, Love, Love all your recipes. Wondering though of the amount of servings and size please (or if just for me how much this makes ..lol). This would also help on a few of your other delicious dishes. I’m glad you like my cooking. All of my recipes say how many servings they make and this custard makes 4 servings – by that I mean 4 dessert cups. I think they hold about 2/3 of a cup each. Jenny, I was wondering if we need to add vanilla extract to this? If so, at what stage should we add it? Also, what heat level should I have my stove on and should I have my stove on at step one?